Cut angel food cake in half horizontally; separate layers. Spread 1 pudding snack on top of bottom cake layer. 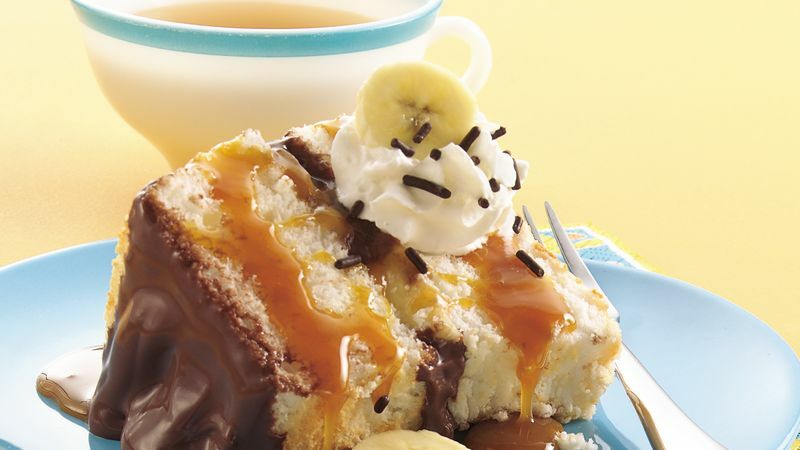 Slice 2 of the bananas into 1/8-inch slices; arrange slices on top of pudding. Place top cake layer on bottom layer, cut side down. Spread second pudding snack on top. Refrigerate at least 2 hours or overnight before serving. To serve, cut cake into 12 slices; place on individual dessert plates. Drizzle each with caramel topping. Slice remaining banana into 12 slices. Top each serving with whipped cream and 1 banana slice. Sprinkle each with 1/2 teaspoon candy sprinkles. To cut cake, measure height; divide in half. Place toothpicks at halfway point; slice with serrated knife above toothpicks.